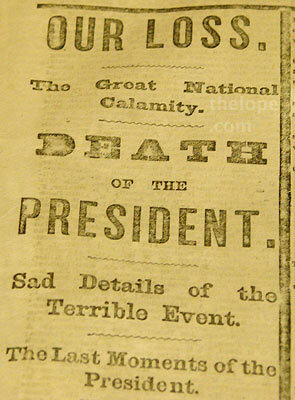 The Kansas Underground Salt Museum has on display a copy of the New York Post published on April 16, 1865 - the day after President Abraham Lincoln died from an assassin's bullet. The newspaper, along with one dated April 14, 1865, are displayed in an area of the museum dedicated to exhibits owned by the adjacent Underground Vaults and Storage, a company that stores materials in the stable temperature and humidity of the salt mines under Hutchinson, Kansas. Washington, April 15 -- 4:40 P.M.
the chief magistrate of the nation. 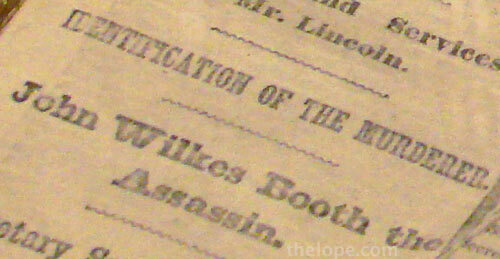 Also on the front page are a few details about John Wilkes Booth. I did not know that he dropped his hat in his escape from Ford Theatre or that fellow actors identified him. The entire front page is a good read, not only for news of the assassination but for the other matters of the day, as well as the editorial attitude of the publication and the language used. It is curious that the newspaper is printed imperfectly, with creases interfering with the inking of the text. The newspaper is part of the permanent display at the museum and is not a special exhibit for the upcoming 200th birthday of Abraham Lincoln. I highly recommend the exhibit area as well as the rest of the museum.